Michelle Jackson is passionate about Detroit’s revitalization. And about having the opportunity to work as an electrician’s apprentice on one of the biggest construction projects underway in Detroit in many years—Little Caesars Arena. 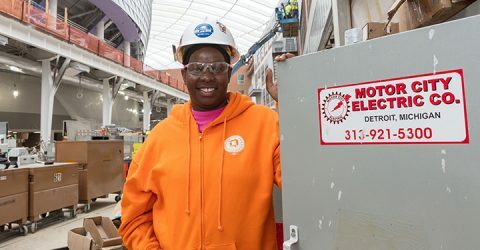 After passing a 10-week, pre-apprenticeship program, Jackson landed at the arena with Motor City Electric Co., which has been located in Detroit for more than 65 years. Here, she’s learning the ropes from other more-experienced electricians. It’s through the apprenticing process that Jackson will learn everything there is to know about electrical work and eventually she’ll stand on her own as a journeyman electrician. Motor City Electric Co. is making a huge impact on their hometown, not only helping young apprentices find careers but leading electrical work on projects throughout The District Detroit including Little Caesars Arena and the Little Caesars World Headquarters campus expansion. By maintaining an apprenticeship program, Motor City Electric Co. is helping to foster the next generation of skilled electricians in Detroit—also contributing to the city’s economy and workforce pipeline and making a positive difference in Detroiters’ lives. Motor City Electric Co. is one of the more than 70 Detroit-based companies that have received contracts to work on The District Detroit and fulfill its “Michigan Made, Detroit Built” pledge. Between the soon-to-open Little Caesars Arena and Little Caesars World Headquarters campus expansion, the company will leave a significant footprint on the city they call home.